A few weeks ago at a family gathering my wife's Aunt, who is single and not a car person, showed me a quote from the dealership for a front brake job on her TL SH-AWD ('13 or '14) and asked me if I thought it was reasonable. Being put on the spot and knowing a brake job on a Honda/Acura is straightforward (plus I happen to be very fond of this aunt) I told her, "No. I can do it for hundreds less." I wasn't sure if she'd take me up on the offer or politely decline. She took my offer. I ordered the parts from Amazon (gotta love Prime). Raybestos premium rotors and Akebono ProACT Ceramic pads. I also picked up fluid in case the system needed to be bled. And I asked her aunt to pick up engine and cabin air filters. The car arrives on Sun AM. It's windy and the temperature is dropping so I get to it. First I changed the engine air filter which was very dirty. 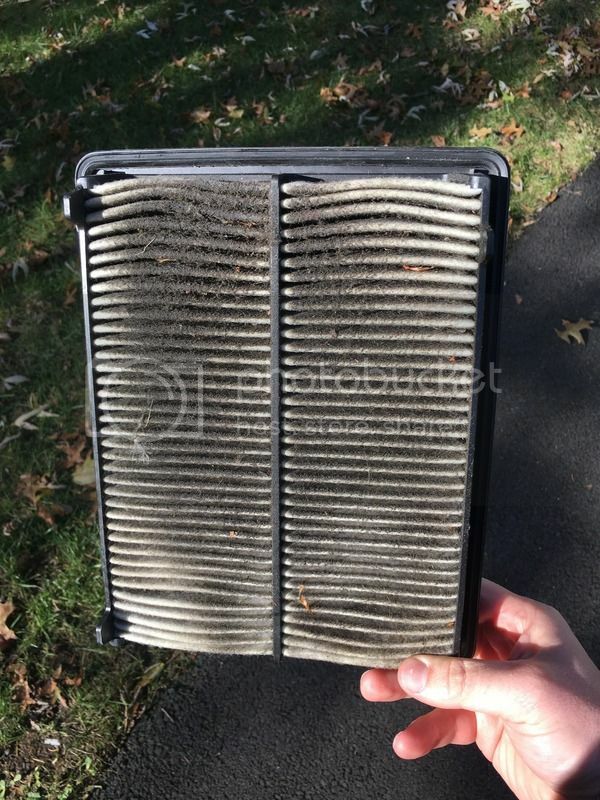 It had been changed last at 25k miles, the car now has 75k miles. Then I moved to the main act, the brakes, starting with the RF. 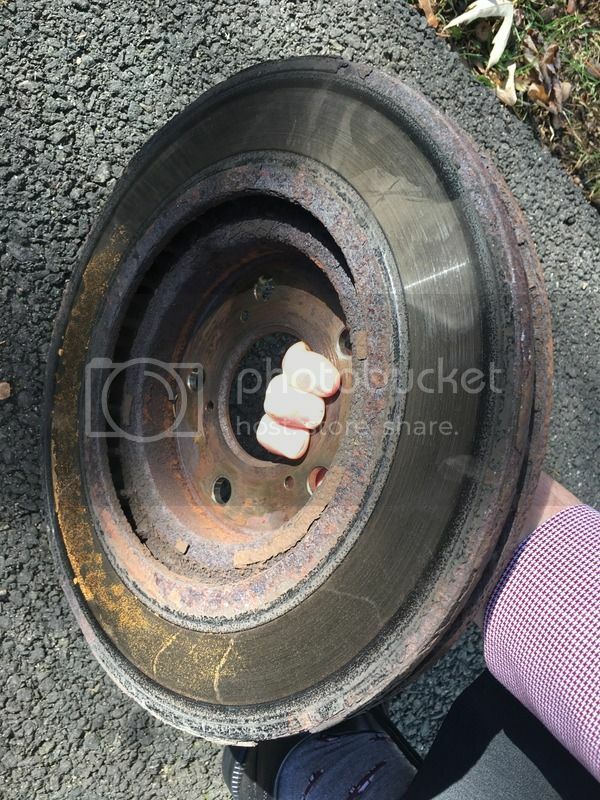 There's a notable amount rust on the brake and suspension components. Iron appears to be flaking off of the rotor from the edge and the cooling vanes plus there's a noticeable lip at the top of the friction surface. One of the two screws holding the rotor on the hub is seized (I expected that). I had to drill it out. One of the caliper bolts took me a long time and a lot of effort to free up. I finally got the caliper off and notice the piston boots aren't in great shape, but I let it go because there's nothing to be done about it now. Then it was time to take the rotor off. It was STUCK. I was banging the it with a hammer, a rubber mallet: nothing. I took a 12mm bolt off of a brake line bracket and used it in one of the threaded pusher holes on the rotor. It finally budges. I put it in the other hole, turn it, and the rotor hat splits in two places radiating from the screw hole! And the rotor still won't come off! I've never had that happen before. Here I am with my wife's aunt's car in the driveway on a Sunday afternoon now in an undriveable condition after I told her, "No problem, I'll change your brakes." I bang it again with the mallet for what seemed like an hour. It would rock a little bit but would not come off. It was time to panic. I text my good buddy who is better with this stuff. He calmed me down and told me to get longer screws to use in the pusher holes, not to give up, and that I wasn't going hurt the hub no matter what I do. I run to Lowes and frantically get two longer M8 1.25 screws. I get back to the car and crank on them. Now the other side of the rotor cracks! Have to keep going. I keep turning the screws and banging the rotor. The cracks are growing but the rotor slowly moves off of the hub and wheel studs. Massive relief. I clean up my defecation from the driveway and get on with it. New rotor goes on, pads go on, and slide pins cleaned & lubed so I decide to start bleeding. Even though starting with the RF was out-of-sequence, the temp. was dropping and I was racing darkness with a whole other side left to do and three more lines to bleed. The fluid was the color of apple cider. I get to the LF wondering if the same fate awaits me. After a lot of banging on my impact driver, I was able to get both rotor-hub screws out, the caliper came off relatively easily, and using my two long M8 1.25 screws I was able to get the rotor off. New rotor goes on, pads go on, slide pins cleaned and lubed, line is bled (my wife is on the pedal for me). The LF took a fraction of the time the RF did; this is the way it should be! Time to bleed the RR. My wife reports a soft pedal. Not sure how air could've gotten in there but the fluid looks good and I don't see bubbles so I button that corner up. Time to bleed the LR. Starts OK and then my wife reports a soft pedal. We keep going with the fluid coming out at a slow drip. Air bubbles start to come out. OK, progress. Pedal firms up but we keep going because I wasn't satisfied with the color of the fluid yet. Soft pedal again. We keep going and all of a sudden a frothy mass of fluid comes out. I've never seen that before. At this point my wife's Aunt is looking over my shoulder and I play it off like 'no problem' even though that's not what I was thinking. We keep going. More air comes out. Finally, as I was running out of new brake fluid, the pedal firms up again. 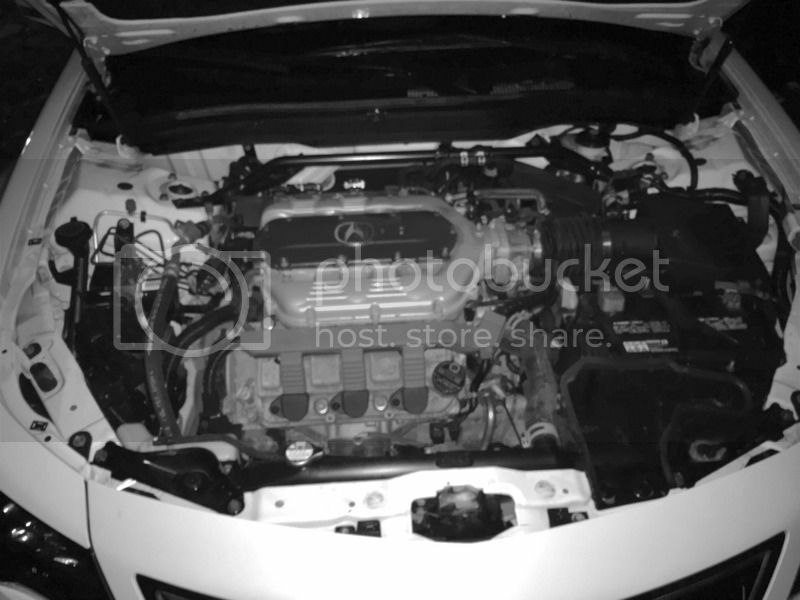 I take the car out for a road test and all seems to be OK. Then, as a matter of pride, I cannot let her leave with the engine bay looking like it did (knowing it would also need an exterior wash to remove splash from the front fenders). It is now getting dark but I press on giving the bay a spray of degreaser (P21S Total Auto Wash) and a good rinse with the hose. I prepare my wash water and give the exterior a quick wash and dry. Her aunt comes out to leave, gets in the car, and it's really slow to crank. I'm thinking, "Are you kidding me?!" It starts and I tell her it will charge on the way home but to have the battery tested anyway. I put everything away and go in the house to warm up and relax. I'm barely able to move at this point because my lower back is so sore from crouching down all day wrestling lug nuts, caliper bolts, rotors, etc. In hindsight I feel really good about pulling it off with the obstacles and giving the car some TLC it would not have received at the dealership. There's a lesson to be learned here. Her Aunt, not being a car person, doesn't really wash her car in the winter when there's salt on the roads (plus it's white so it doesn't *appear* dirty as quickly). 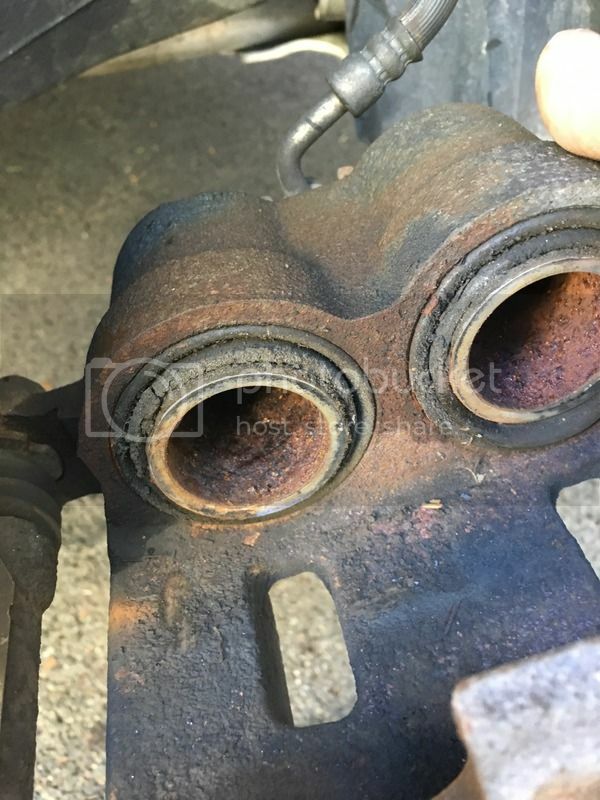 Because of that, the brake and suspension components were in a condition I would not expect to see on a 4 year old Acura (maybe a 10 year old Acura or like a 5 year old Subaru :-P). Hope you enjoyed the story and remember to tell your friends and family, whose cars you may have the pleasure of working one one day, to keep up with maintenance and cleaning year-round! With age comes wisdom. One learns when to say no, for your own sake. I only work on my immediate family's cars now and only on projects I choose to do. Too many others simply don't appreciate all the work involved. Working on a neglected car irritates me to no end. And, often times that old adage applies: No good deed goes unpunished. I suppose its just part of becoming an old curmudgeon (and proud of it). Having said that, you deserve a big high five for assisting your aunt. You saved her a bundle and she got much more than a dealer would have done. Kudos for the fine effort. Funny, my wife came out a few times during the process and said, 'no good deed goes unpunished.' If it were an older car, I definitely would've said no but I genuinely didn't expect the fasteners to be that tough to remove on a relatively young car. Her aunt seems to take pride in the car but it wasn't until after the rotor cracked on the hub that I asked her about her winter washing habits. I put anti-seize on the rotor-hub screws so whoever does it in X years doesn't have the same problem. I never push in the calipers without cleaning up the boots first. I usually hit them up with WD40. I bet all the dirt and rust flakes would've cleaned up nicely and the boots probably would look brand new. Now with all that dirt and rust flakes, they may end up rubbing through. I didn't think of WD40 (that's a good idea); however, I did consider cleaning them and thought if any of that stuff is really adhered to the rubber I could turn debris into a real hole. If that happened I was not equipped to do anything about it. I appreciate the suggestion though! 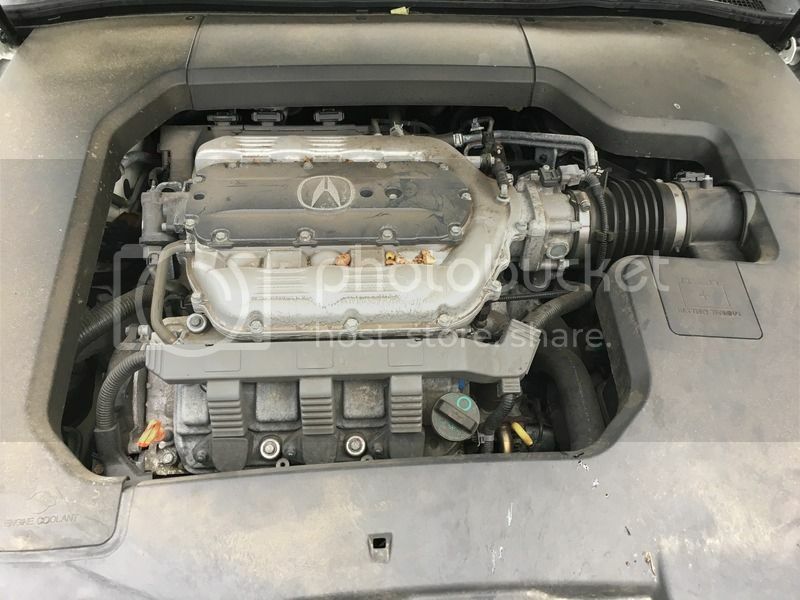 How much was the estimate from dealer versus what you paid for parts and supplies? Nice job! Thank you! I think the dealer price was $425 (but I don't think that included a bleed)? All parts and supplies were purchased for $176 (including my two emergency M8 1.25 screws). She brought me my favorite IPA that is nearly impossible to get outside of the CT area. Last edited by gofast182; 11/22/17 03:54 PM. I too like to just wipe down the piston boots with a rag wet with silicone spray or the likes, then apply some sil-glyde to the rubber. I've had rotors crack too when sweating it out trying to remove them. No fun. Last edited by JTK; 11/22/17 03:59 PM. Man, those calipers! I don't think the ones on my old cars even look like that. Kudos on helping out a family member. I'm sure she appreciates it. Great writeup and an even better gesture. did that include new rotors? i bet it did not include a brake flush. Thanks. The writeup was better before it was edited by the mods. 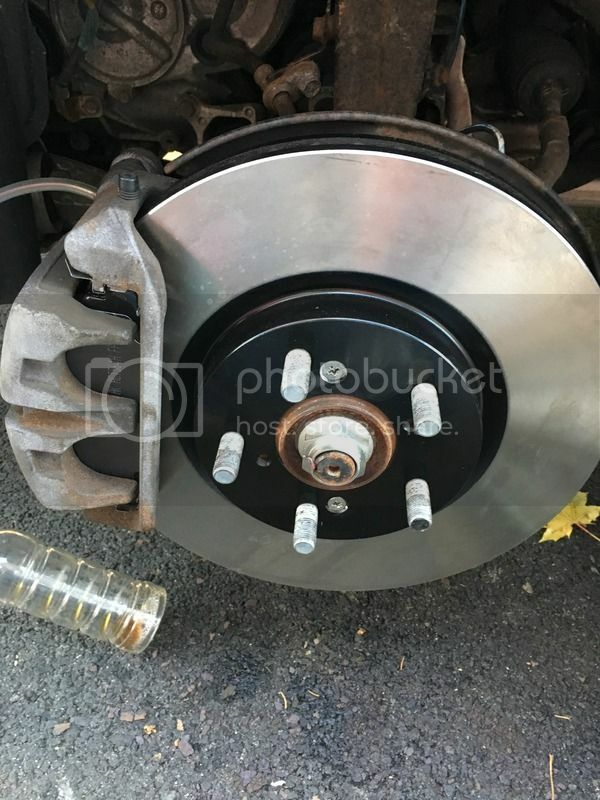 How do the rear brakes look esp with 75k on it? Oh and I saw the unedited version of the OP. Last edited by SatinSilver; 11/22/17 04:21 PM.